Voorwerpje roundup – we have a paper! Eighteen thousand candidate active galactic nuclei. One hundred ninety-nine Zooites. 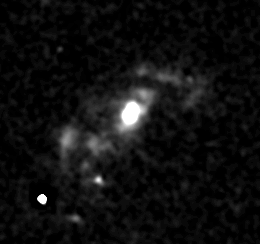 A hundred fifty-four possible galaxies with clouds, of which 49 became targets for spectra. And finally, nineteen certified Voorwerpjes – giant clouds of gas ionized by a central active nucleus, like Hanny’s Voorwerp but smaller (and sometimes not all that much smaller) and dimmer. Of these clouds, many (including the largest) are new discoveries. That’s a short description of the current status of the Galaxy Zoo Voorwerpje Hunt project. We just submitted a 28-page manuscript with all the gory details to the Monthly Notices of the Royal Astronomical Society (we’ll post the whole thing once it passes muster with the referee). Probably the most exciting result is that about half of these have gas too highly ionized too far from the nucleus to account for by the nucleus we see (even including far-infrared results to tell how much radiation is being absorbed by dust), so they may be additional, less dramatic instances of the AGN fading over time spans of 100,000 years or so. This large fraction suggests that at least Seyfert nuclei may constantly be brightening and fading over times of a few hundred thousands years (a time span about which we’ve previously had almost no information). This is even more impressive when you know that the gas extends more than 200,000 light-years end to end. This graph compares the spectrum of its nucleus (upper trace) to one of the giant clouds. The key points are in the relative intensities of the emission peaks, especially from Ne4+ and He+ (whose locations are marked with the red dotted lines). Starlight doesn’t have enough far-ultraviolet or X-rays to make gas that highly ionized, but an active galactic nucleus does. Furthermore, the ratios of these lines let us estimate how intense this radiation is when it reaches a cloud. From our spectra, we also get information on the Doppler shifts across the galaxy and its gas. Here’s what we see for UGC 7342. The horizontal axis is distance along the spectrograph slit – each little tick is a kiloparsec, 3,200 light-years, at the galaxy. The vertical axis is the amount of Doppler shift in km/s relative to the galaxy core (this was taken out of a montage so the labels got clipped). The colored traces at the bottom show the intensity of starlight and of each emission line along the slit, to show how velocity features line up with the galaxy and clouds. Even though UGC 7342 is pretty chewed up because of an interaction with at least one companion, the gas motions aren’t as chaotic as they might be – the gas isn’t orbiting retrograde or anything. We see some patterns emerge. Most of these ionized clouds are fond in galaxies which are interacting or merging. That makes sense (and fits as well with IC 2497 and Hanny’s Voorwerp) – tidal disturbances can pull streams of gas well out of the galaxy, and out of the pane of a spiral’s disk, giving a distant target to show us whether there is strong radiation there. About half of these galaxies show two ionized clouds on opposite sides, tracing the emerging radiation – it can get out on both sides of the central accretion disk, and as long as there is enough gas, we’ll see it on both sides. Of course, we want to know more. Answers tend to multiply questions. Hubble observations are scheduled, and (with a little luck) X-ray measurements with ESA’s XMM-Newton observatory. We’ve managed to interest some of the people at ASTRON in the Netherlands in using the Westerbork array to examine the cold hydrogen around these galaxies. 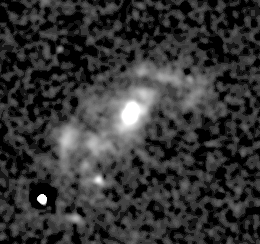 In addition, we’re doing new observations of various samples of active and “nonactive” galaxies to look for fainter, and maybe older, gas clouds. Special thanks to everyone who participated in this project, either through the targeted hunt or the complementary forum search for clouds in galaxies not listed as AGN. Stay tuned! It really does look like a crab in H-alpha. Or perhaps a tarantula with lasers for eyes (that’s 8 lasers)? Hi – do the folks who assist you from this site also receive credit on teh paper? @Deborah Leddon : Absolutely! They’re all credited in the paper, which we’re still waiting a referee’s response on. What makes a good Zooniverse project?